Dress him in clothes that do not restrict his movement such as short trousers with elastic waists or play suits without fitted feet rather than play suits with fitted feet that restrict his natural ability to move. Lightweight fabrics rather than coarse fabrics like denim also make it easier to move his body. Watch your child and when he seems unhappy consider that there may be something about his clothes that is restricting his movement and frustrating him. The kind of clothes that suit a new born baby will not be right for the child that is starting to crawl. As time goes by think about how his clothes can facilitate his movement. 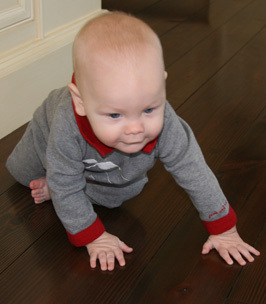 For example, it is good to have something to protect his knees when he is crawling but it can be an obstacle when he is laying on his back trying to kick his legs freely. His clothes should always facilitate the level of movement that he has reached.